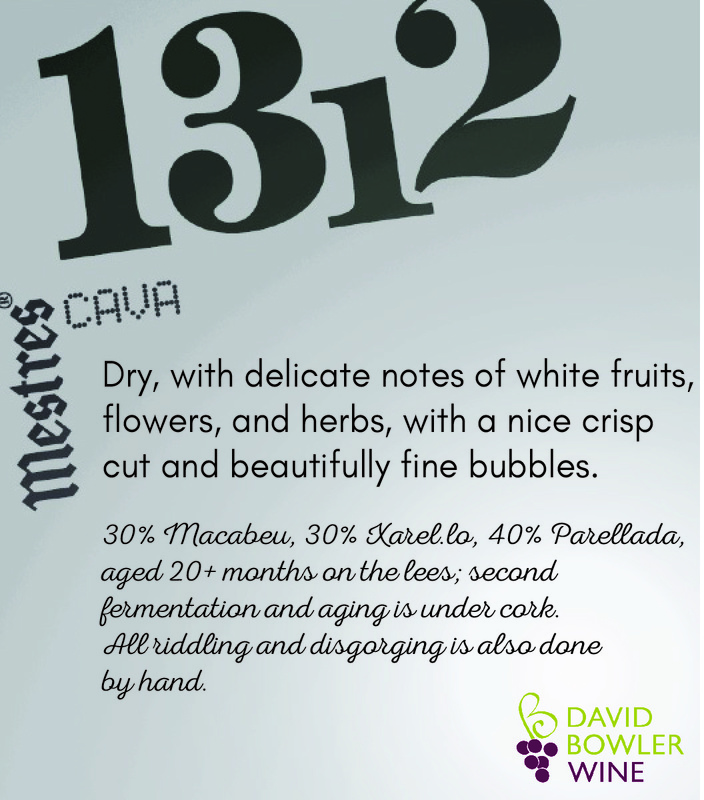 Nothing has changed at Mestres since they produced their first Cava bottle, and you can taste the respect for their terroir and authenticity in their wines. The first records of the family as vinegrowers and négociants date back to 1312. In the 1600’s they began construction of the actual winery in San Sadurni d’Anoia, Penedes, Spain, which was finished in 1861. They bottled their first sparkling wine in 1925, and opened their first bottle to celebrate Christmas in 1928. They were the first producer to register the word cava in 1959, a word chosen to convey that this was a sparkling wine aged in a cellar. They have always used the traditional grapes of their terroir: Xarel-lo, Parellada and Macabeu, all of them hand harvested on their 74 acres of vineyards, situated at 690 feet above sea level. These are some of the oldest vineyards in the area. To protect their patrimony, no insecticides or herbicides are used at the vineyard, and pruning is carried out to reduce their vigor, therefore producing grapes of greater ripeness and intensity. Today, they still use traditional methods taught by their ancestors including, long aging in caves. The youngest of their wines is aged 2 years in the cellar, making all of their bottlings either Reserva or Gran Reserva. In order to achieve wines that are full and rich, aging is never rushed- the wines undergo a natural stabilization process during their long aging, so that the crystals which form can then be dégorged along with the yeasts. All of their production is aged under cork, and for all bottles riddling and dégorge is done by hand.